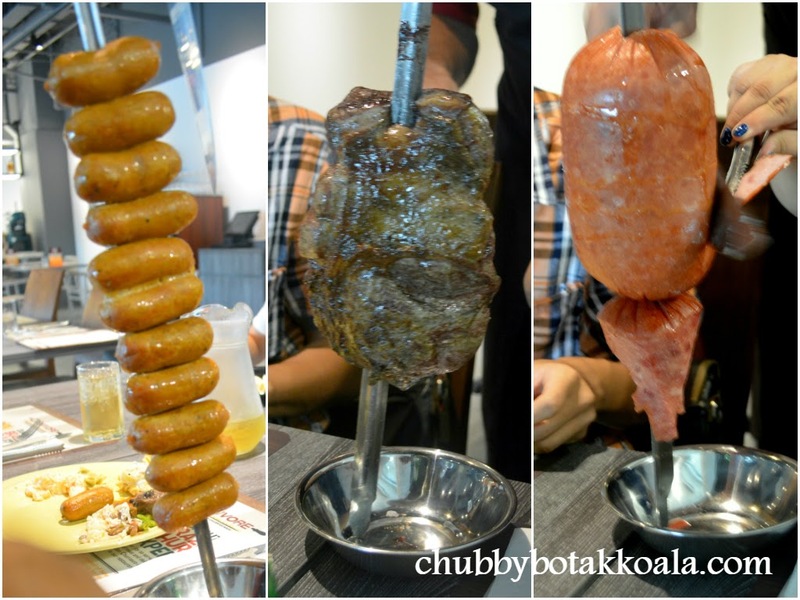 Chubby Botak Koala - Singapore Food Blog, Travel and Lifestyle: Carnivore Grandstand – SIM, Por Favor = Yes, Please !!! Carnivore Grandstand – SIM, Por Favor = Yes, Please !!! 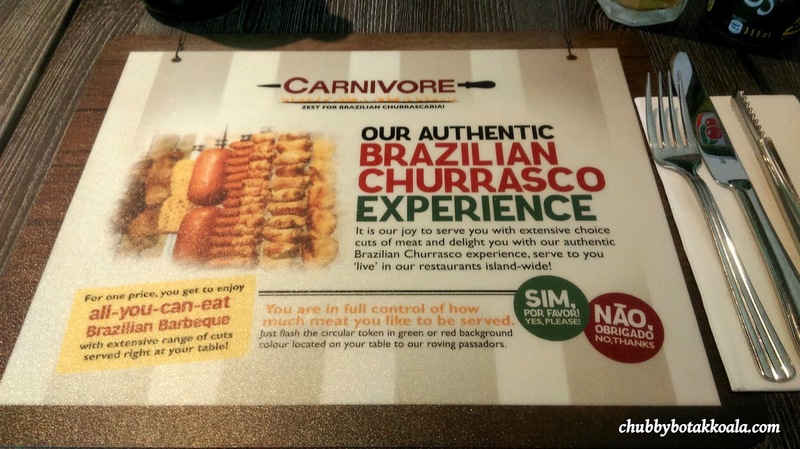 Carnivore is one of the leading Brazilian Churrasco restaurants in Singapore just opened its latest outlet in Grandstand. Like the rest of its outlet, Carnivore is a buffet restaurant, so for meat lovers, this is a place you must try. We were there for lunch during Deepavali and apparently it was only open for seven days according to the service staff. If you never been to Carnivore before, it has a very interesting concept. After you are seated, order your drinks and proceed to the buffet counter for your side dishes and sauces. Once you are back to your seat, put the sign for SIM, Por Favour (Yes, Please). The knife wielding Passadors (meat waiters) will come to you individually and sever you with the rotisserie-roasted selection of meat. This will goes on and on until you turn the sign to NÃO, Obrigado (No, Thanks). Check out the following on what on offers for on the sauces, salads and side dishes. My suggestions are to stick with something light. Our favourites were the Tomato and Mozarella Cheese, Mash Potatoes and Mushrooms Salad. For sauces, make sure you try Chimichurri, Homemade BBQ Sauce and Capsicum Vinaigrette. Those tangy and acidic sauce will be good to break down the fats in the meat and allow you to eat more. We started on our Carnivore Gastronomic journey with Pork Sausage. It is thick, slightly salty and a bit dry. It will be good if the sausage has more fat in it. Lamb Shoulder, although the board says leg of lamb, I was told by the Passador it was lamb shoulder. It is juicy with slight pinkish in the middle. Expect the lamb to be a springy texture but delicious. Ham, similar taste to our day to day ham, except it is a bit drier due to the roasting. Pork Sausage, Lamb Shoulder & Ham. Chicken thigh was well seasoned, tender and succulent. In comparison the Chicken breast with bacon was on the drier side. If you get the Beef Rump on the first cut, it's the best. Nicely done with a good charred and well balance of fats and meat. The best cut of the day in my opinion. Pork belly was all right, with minimum fats but I find it missing the juiciness. Instead tasting like being grilled, it has a texture more like a smoked pork belly. The Beef tenderloin was also good, but it was not as tender and juicy compare to the rump. The fish thick and flavourful. They will need to use those big fishes so the meat does not break down easily. At the end the first cycle of meat, the Passador served the grilled pineapple. It is juicy with a nice caramelisation on the outer part. Good to cut through the jelakness and overwhelming sensation from too much meat. We actually have additional 2 servings of beef, lamb and pineapple before we turn the sign to NÃO, Obrigado (No, Thanks). Service was excellent, the service staff was very attentive and informative. He actually recommend the Brazilian Guarana. Tasted like red bull with more gas and less sugar. They also clear our plate regularly. The décor is very simple, nice and clean. There are lots of natural light, as they use glasses as wall for the section wall facing the outdoor. Overall, it has been ages since we had our last Brazilian Churrasco. If you have are a meat lover, you must give this place a try. The food here is good, and we find the buffet lunch is really value for money and enough time to digest those proteins. We actually had simple and light dinner that day, as we were stuffed from the lunch. Cheers! !